Elder is probably the most well-known antiviral herb on the market at present. It can assist in reducing inflammation in the sinuses to relieve congestion, eliminate metabolic waste products, stimulate sweating to remediate fevers, and reduce flu and cold symptoms. Elderberries contain shikimic acid, an intermediary in the production of Tamiflu, an anti-flu pharmaceutical. While commercial production of Tamiflu uses the shikimic acid in Star Anise, elderberries also contain this valuable substance. Cool beans, Elderberry! While vitamin A, calcium, magnesium, potassium, niacin, iron, valerianic acid, viburnic and shikimic acids, tyrosine (a monoamine precursor), and other health supporting alkaloids and nutrients in elderberries can withstand heating and drying, the Vitamin C complex, cyanogenic glycosides, polyphenols, and many other flavonoids (AKA antioxidants) cannot. Heat and drying, whether it is stove top heat, or drying with stoves, dehydrators, microwaves, (for the love of all things holy, please never use a microwave to dry herbs or for any other reason), or any other heat source will degrade to destroy many the flavonoids in plants (1). Bioflavonoids are capable of increasing bodily health by supporting strong immune function and cell formation, destroying cancer causing free radicals in the body that corrupt cellular information, have anti-inflammatory and anti-allergic properties, and are antiviral and antibacterial to name just a few of their actions in the body. The most commonly found information on the “interwebs” says to use dried elderberries, make a tea, and then make a syrup from the tea. Boom! Drying and heating. You’ve immediately lost a very important component of elderberries’ super powers! Some websites even go as far as to advise the use plain sugar instead of honey in making the syrup. While honey contains its own antibacterial properties and aids in the extraction of flavonoids, alkaloids, and nutrients; sugar, on the other hand, does none of this and decreases immune activity for several hours upon ingestion. Please be very skeptical of herbal information given out, and read all blogs, facebook posts, instagram and pinterest cuteness with a grain of salt. Much information is of “copy and paste” quality. What to believe? Just because the same information is on several sites does not mean it’s good info. Do your research before harvesting and making herbal medicine. My awesome apprentices really get into preparing their harvests for remedies! 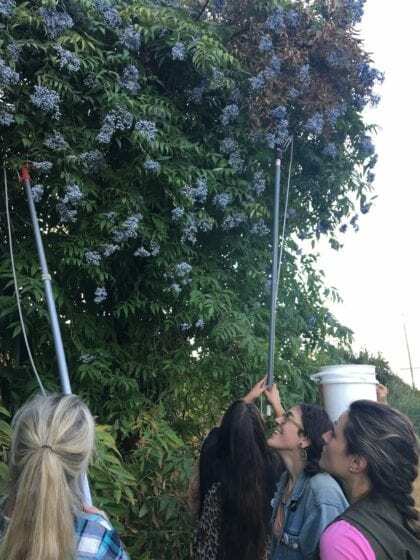 In order to retain the immune supporting and antiviral vitamin C complex and flavonoids in addition to the alkoloids, it’s best to prepare elderberries fresh. Flavonoids/antioxidants are water soluble. Use 80 to 100 proof vodka in your remedies to ensure that they will be extracted well. Remember that the stems and seeds of elder contain toxins and must be removed. In order to easily separate the elderberries from the rest of the plant material, freeze the harvest overnight. Garble the berries from the stems while they are still frozen. Once the berries thaw out, it becomes difficult, time consuming, and messy to remove the stems. Now, put a small amount of berries at a time in a bowl, and gently squish them to break open the skins, making sure to not break open the seeds. Fill a jar 1/2 of the way up the jar with all your fresh squished berries. Fill half the jar with either brandy or apple cider vinegar, then top off with honey. Brandy and honey make an elixir, apple cider vinegar and honey make an oxymel. Tightly cover the jar with a plastic lid, or with a piece of parchment paper between the metal lid and the vinegar if making an oxymel, and put it on a dish as there may be some leakage. Let macerate in your fridge (to prevent fermentation) for a month, then strain all plant material including the seeds. If you choose to make a straight up alcohol tincture, fill your jar halfway with the mashed berries, then fill to the top of the jar with 100 proof alcohol to extract and preserve all alkaloids and antioxidants. It may be necessary to refrigerate the alcohol tinctures while they’re macerating to prevent fermentation. Be sure to put a label on your jars/bottles so you know what you made! A half to a whole teaspoon in a cup of warm water several times a day is all that is needed to provide relief. As elixirs and oxymels take a month to macerate fully, you might want to get on this right away! You, your family, and your friends will be very happy when you provide them with herbal medicine that works well! I’m a big proponent for “getting the medicine to the people in a way they’ll take it.” I teach this to my apprentices. How can we get the medicine of elder in someone who won’t take a tincture? Or doesn’t like the taste of vinegar? My husband is a big fan of honey. He puts it on his bread and in his coffee every day. I make several gallons of herbal honeys; willow, ginger, lavender, devil’s club, dandelion, hawthorn, wild currants, and elderberry are just a few of what I’ve made for him this year. I keep a selection of small honeypots on the table for him to dip into every day. I make him lemonade with herbal honeys and elixirs in them. He utilizes herbal medicine every day, but it is so part of his daily habit now that he doesn’t realize it. I’m happy to know that I’m feeding him well and keeping him healthy. He’s just happy to eat his honey! For more info on herbal medicine making, read our plant medicine made easy tutorial. For reducing inflammation and fevers, and eliminating metabolic waste, the elder *FLOWERS* of the blue (not red) elder can used. You’ll find these available in June, generally speaking. It could be earlier or later, depending on environment and weather each year. To make a great-tasting and effective elder syrup, put 2 cups of water in a saucepan. Add 1 cup of dried blue elderflowers. Bring to a boil, turn it down to a medium simmer, and let this simmer until half of the liquid is gone. The resulting brew is called a decoction. Strain the elder from the decoction, rinse out your pan, and return the strained decoction to the pan. Add twice the amount of honey to the decoction, heat until the honey is thoroughly incorporated into the decoction, and jar it up. You now have elderflower syrup that can be taken by the teaspoon straight, added to teas, warm water, drizzled over yogurt, ice cream, oatmeal, and more. Kids over 2 years of age love this syrup, and it will keep all winter in the fridge. I know the latest info is that babes over 1 year can ingest honey, but I’m not buying the hype. Keep in mind that the flavonoids in the flowers will be destroyed, but other alkaloids will remain intact. There you have it. The truth about elderberries! Keep believing in herbal medicine, because it’s awesome, and be healthy! Thank you for this- we are lucky to have a tree in our yard! I’m confused on the seeds- can you clarify what to do with them I the processing? Looks like the squeezing of the berry is meant to remove the seed (?) but that the seeds are also contained in a small sac that’s not meant to be broken? Do you remove these, separate, and then keep the remaining berry? Are there many seeds per pouch? Thank you! Breaking open the skins of the berries allows the menstruum easy access to the medicine inside. We do not want to break the seeds, as they contain chemicals that are harmful. The seeds are strained out after the remedy is ready. Yes, there is “goo” around each seed. The goo is medicinal! The mentstrua will be able to dissolve the medicine in the goo surrounding the seeds. 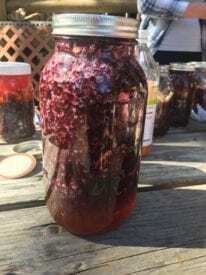 I’ve been writing a book on elderberry foraging and recipes, and I’ve researched extensively on the subject of how heat will affect the medicinal properties of elderberries. 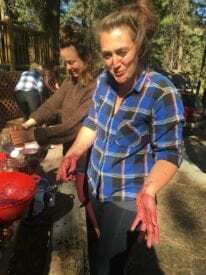 I especially wanted to know about the high heat involved in canning, since so many herbal sites recommend canning the juice but I thought the heat might harm the compounds in it. This is the first time I’ve seen mention that even drying elderberries harms the compounds. Rosemary Gladstar herself recommends using dried elderberries for anti-flu syrup, and I’m pretty inclined to believe anything Ms. Gladstar says (big fan here). Are you saying that all those herbalists are wrong and elderberries can only be used raw for medicinal purposes? I would love to find some research either way, as I’ve read that some of the medicinal properties are actually increased through heating but now I’m seeing this. Do you know of any studies? Thanks! Thank you for your comment and questions. I’ve never been one to debate what other herbalists say or do. There are many ways to make herbal medicine. Some are valid, some not. While some of the antiviral properties of the elder, as I stated in my article, are preserved with heat and drying, the bulk of the medicine is in the antioxidants. Antioxidants are a very large group of chemicals that have a wide variety of actions including antiviral, antiallergic, anti-inflammatory, antibacterial, anticancer, and more. Science shows that many antioxidants are destroyed with heat and drying. Please feel free to do your research on this, and provide a book that is well written with valid info. Do you have a site where you sell your stuff at? 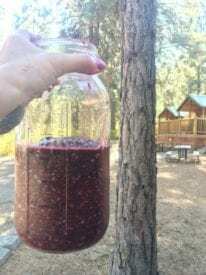 What is your feeling on making elderberry syrup using an instant pot (pressure cooker)? The berries will spend less time “cooking” but at a higher heat than stovetop. Any time with heat will destroy many of the medicinal bioflavonoids in the berries. The loss of so much of the medicine after the effort of harvesting and processing would be sad! What should I do if I do not have access to fresh elder berries? It’s just my luck that I purchased dried elder berries moments before I found this blog and so cannot undo my purchase, but even so, I don’t have fresh anywhere. I am going to be planting my own tree somewhere down the road, but that will take some time to begin producing the berries. Could I help maintain as much of the good stuff as possible by using the alcohol with the dried berries instead of boiling them in water? Perhaps chopping the dried berries up first? Any thoughts on this would be appreciated. This is my very first foray into the use of home made herbal concoctions. I would hate to have spend $17 on berries without trying to get as many benefits as possible out of them. Thank you. Drying and heat do destroy many, but not all, of the bioflavonoids. Sometimes we have to wait until the season for the part of the plant we wish to harvest is available again. We will see fresh elderberries in September. During the 27 years that I made herbal products for sale, there were times when I just did not have a product because I didn’t get the harvest done in a timely manner, or nature did her own thing and the plant was ready earlier one year than the next. My customers knew they would get the best quality products from me, because I paid such good attention to detail and only harvested plants when they were ready. I strove to be the best of the best with the medicine in my bottles and jars as this was (and still carries today) my reputation to create and sell quality herbal medicine that worked! 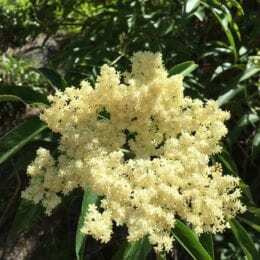 Is there any good use for dry elderberry’s? Sure! The micro and macro nutrients such as sugars and minerals are still viable. Some other constituents may be as well. I am a bit confused because many of the sites I’ve read say they are poisonous raw. Thanks for asking! It’s the seeds that should not be eaten. The skins and juice are fine. Many sites simply copy and paste info from other places on the internet. Not always with either good or entire info. I process mine by gently breaking open the skins, but never crushing the seeds. The seeds are tough and will not let in menstruum if unbroken. I’ve been eating raw blue elderberries for years and am alive to tell the tale without a single issue. Granted, I swirl them in my mouth to get the juice and skins and spit out the seeds. I don’t put them in smoothies. We need to be smart! Thank you for that information. It was really useful and informative. Some sites say that eating raw elderberries can be harmful, especially if eaten in large quantities.. Do you have any thoughts on this? Thanks for asking! It’s the seeds that should not be eaten. The skins and juice are fine. I process mine by gently breaking open the skins, but never crushing the seeds. The seeds are tough and will not let in menstruum if unbroken. I’ve been eating raw blue elderberries for years and am alive to tell the tale without a single issue. Granted, I don’t put them in smoothies or anything like that. That would not be smart. I’ll eat a few while I’m harvesting and processing them. I swirl them in my mouth to access the juice and skins, but don’t crunch down on them to break open the seeds. I spit the seeds out. Ok, I’ve read your comments and answers section Can you recommend any recipe that will make beneficial use of the dried elderberries that many of us have purchased before we became wiser through the information on your website? Thank you for sharing your research. Sure JJ! Dried elderberries contain calcium, magnesium, potassium. Fiber, fructose/glucose/sucrose/levulose, iron, zinc. Malic and lactic acid. Tartaric acid, which, with malic acid, has an alkalizing and cleansing effect in the body. Malic acid is part of the ATP chain! Niacin, which is anti-histaminic, anti-dermatitic, anti-dementia, and anti-vertigo. Elderberries contain valerianic acid which is antispasmodic. Yes, valerianic acid, just like our local wild valerian! All the cool stuff! 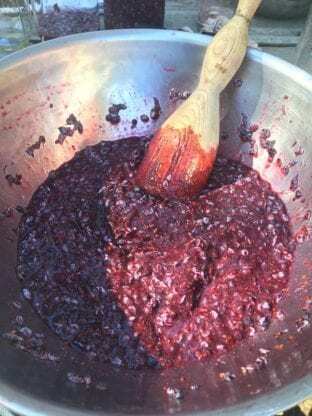 You can use the dried elderberries to make a heated syrup.There are 14,563,678,789.3454306 recipes out there and all are pretty much the same. In my case, if I’m using dried plant material to make a syrup, I use honey vs sugar. Honey is acidic and has its own benefits. I gently heat the honey in the strained dried plant decoction (check out my Plant Medicine Made Easy for instructions on decoctions) 2:1. 2 parts honey and 1 part decoction. I know that I will be able to more easily assimilate the iron and calcium with acidic foods and menstrua. Honey is acidic and is the perfect vehicle for transporting iron and calcium to our cells. Hi – how long do the dried elderberries last in the bag they were purchased in? Should they be stored in the fridge and for how long will they keep? Thanks! It depends on how long ago they had been picked, the quality of the drying, and how long they sat around the warehouse before they were purchased. Whole berries should last for a year at the most, if they were processed and stored properly. Sounds like you know what you‘re doing! I used to make elderberry wine back in the 80s.Won ribbons at contests.Started making our own jelly . delicious. Got to thinking what else can i make? Saw sambucus products on shelves at pharmacy. Counter help said Amish people swear by sambucus , and pharmacy cant keep shelves stocked. So I started making my own elixer? a few years ago. We pick fresh berries and freeze until ready to work with them. Then thaw them out, run them thru a food processor? that separates seeds and skins, while pure juice comes out. No breaking of seeds.Use unflavored brandy 46 proof? along with some lemon zest, cloves, cinnamon. I also started adding a little aronia juice. Let sit for 8 weeks in fridge. No heating occurs. Strain off into brown bottles and refrigerate. Always was leery of heating any plant products. Any suggestions on improving my recipe would be appreciated. Your recipe sounds super tasty AND medicinal all at the same time! I use the skins as they contain so many of the healthy antioxidants. You could try adding some fresh ginger as well. Glad you’re on the “no heating” bandwagon! It’s the smart thing to do, herbally. 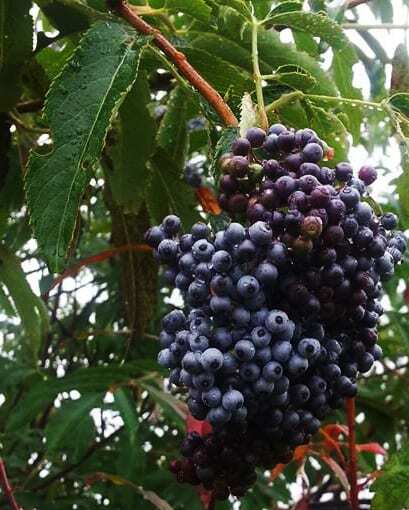 The elderberries that grow in Missouri are a red/purple variety, not blue. I have been harvesting them in August and freezing them. In winter I boil them with blackberries, mulberries, and strawberries to make a delicious juice. I add a can of frozen grape concentrate to my juice to sweeten it. I strain out the seeds after I have cooked them. Is this a safe way to prepare them or does the heating release the toxins in the seeds? We drink large quantities of this juice especially when we have a cold going around. As long as the seeds are not cracked open, you are safe. Just as a heads up, boiling the berries will destroy a portion of the medicine. I am deeply appreciative of this nuanced and fully-informed article. I have a huge number of frozen elderberries and have been trying to decide whether to make syrup or tincture. I was worried about the presence of the seeds and the alcohol extracting the toxins. This article allayed those fears and I will go with the tincture (although I may make a little syrup and combine the two for tastiness). Does freezing fresh elderberries destroy the flavonoids like heating does? I’ve found a source for fresh, frozen wild elderberries and wondering if this is a better choice than dried. I’m assuming I could thaw and use following your recipes, however please advise if that won’t work. Thanks in advance! Freezing for short periods of time do not destroy the flavonoids. Freezer burn is certainly something to avoid, however, so no longer than 6 months in the freezer, well wrapped. We love elderberry pie. Which cooks the berries and seeds? Should this also be avoided? 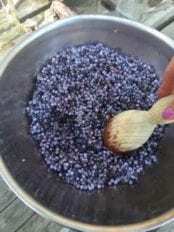 Or does cooking the berries in pie also make the seeds less toxic? That‘s a good question! Elderberry pie sounds wonderful. I know that there are people who bake the blue elderberries whole in the pie, thinking that they will poop out the seeds unbroken. I‘m not so sure about this, myself. While the seeds do have a hard seed covering, they can be broken when chewing or during the digestive process. I‘m trying to think how to separate the seeds from the berries for a pie. I‘m kind of stumped, to tell you the truth. Has anyone out there made elderberry pie and can jump in with comments? Thanks!